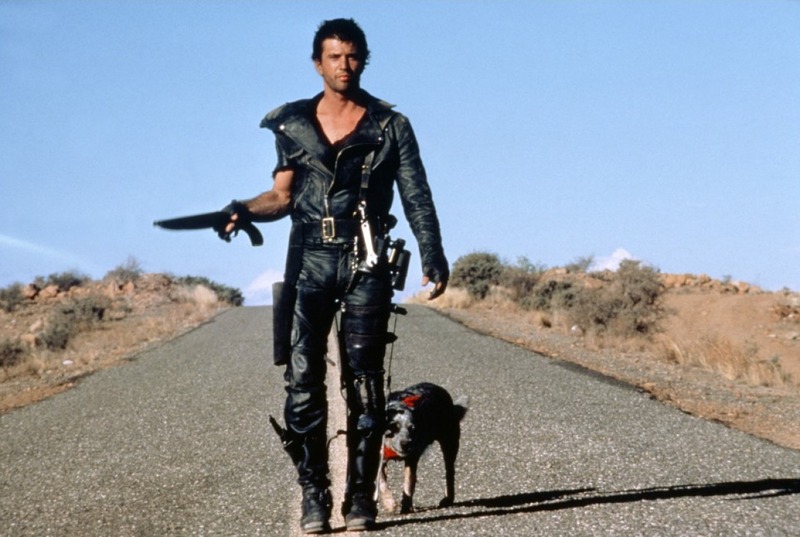 A massive boost of kinetic energy, Mad Max 2: The Road Warrior is a superlative glorification of mechanized carnage. The old fashioned Western theme of the loner hero coming to the aid of a desperate community is given a new, post-apocalyptic desert setting, and an overdose of destructive mayhem. In a world utterly annihilated by nuclear warfare, the search for oil is the one remaining quest for the few surviving humans. In the barren deserts, former police officer Mad Max (Mel Gibson) drives his V-8 Pursuit Special, with only his dog for company. Max spends his days looking for gas and dodging violent marauders driving an assortment of bikes and modified trucks. The outlaws are led by The Humungus (Kjell Nilsson), a muscular brute of a man, but the real freak is his second-in-command Wez (Vernon Wells), a mohawked, bug-eyed killer. Max meets and overpowers the Gyro Captain (Bruce Spence), the somewhat sane pilot of a rickety gyrocopter. To preserve his life, the Gyro Captain reveals to Max the location of a besieged settlement where the residents have built an oil drill and refinery, accumulating a large supply of oil. Pappagallo (Michael Preston) is their leader, and his people include the silent but deadly boy known as the Feral Kid (Emil Minty), and Warrior Woman (Virginia Hey). The settlement is surrounded by The Humungus and his men. Max may have the skill, knowledge and courage to help the settlers break the siege and transport their precious oil cargo to a safer place, but he has to decide if he wants to get involved with the problems of other people. One of the pinnacles of Australia's film industry, Mad Max 2 is an unrelenting experience. The action starts early and does not abate, as an economy of words and an abundance of commotion combine to create a thrill ride. Director George Miller is focused on constructing a wondrous sensory experience, and the film is a feast of strange men and strange machines battling for survival. Mad Max 2 becomes a fantasy of imaginative toys and costumes given unfettered freedom to roam and collide in the wide open desert. Mel Gibson as Max established himself as an action hero in the Clint Eastwood mould, the strong, silent, confident type, replacing words with results. Gibson is not required to do much in terms of emoting, but his cool presence in black leather, driving the fastest car, carrying the biggest gun, and showing the least fear, creates potent presence. Apart from the character of Max, there is no room for subtleties in this world. The Humungus, Wez and their men are bad as bad can be, decked out in post-punk dregs, blood-thirsty savages looking for the next victim to brutalize. Pappagallo and his community are all good, dressed in white, keepers of the flame of humanity's belief that there is more to life than barbarism. Max does not fit in either camp, a man tortured by the death of his family (in the original 1979 Mad Max) and still deciding if there is any hope for the re-establishment of civilization. He takes his time deciding if and when he wants to help Pappagallo, and his motivations for doing so remain primarily about self-preservation rather than any belief in a greater good. 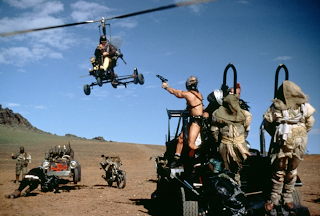 Mad Max 2 unfolds at an astonishing pace. The film is an ode to powerful vehicles travelling at ridiculous speeds, unconstrained by rules or limits. The crashes, flips and turnovers are jarring in their intensity, supplemented by astounding stunt work. The climax is an incessant pursuit to the death, 30 minutes of motors running fully open as brutishness chases down hope. When it comes to saving the future, Mad Max 2 finds plenty of heart, and it's measured in rpms.